Houghton Mifflin Harcourt, 9780547928289, 384pp. For over fifty years, Charles Simic has been widely celebrated for his brilliant and innovative poetic imagery, his sardonic wit, and a voice all his own. He has been awarded nearly every major literary prize for his poetry, including a Pulitzer and a MacArthur grant, in addition to serving as the poet laureate of the United States in 2007 and 2008. 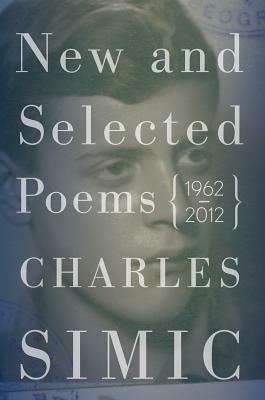 In this new volume, he distills his life’s work, combining for the first time the best of his early poems with his later works—including nearly three dozen revisions—along with seventeen new, never-before-published poems. Simic’s body of work draws inspiration from a range of topics, from the inscrutability of ordinary life to American blues, from folktales to marriage and war. Consistently exciting and unexpected, the nearly four hundred poems in this volume represent the best of one of America’s most distinguished and original poets.